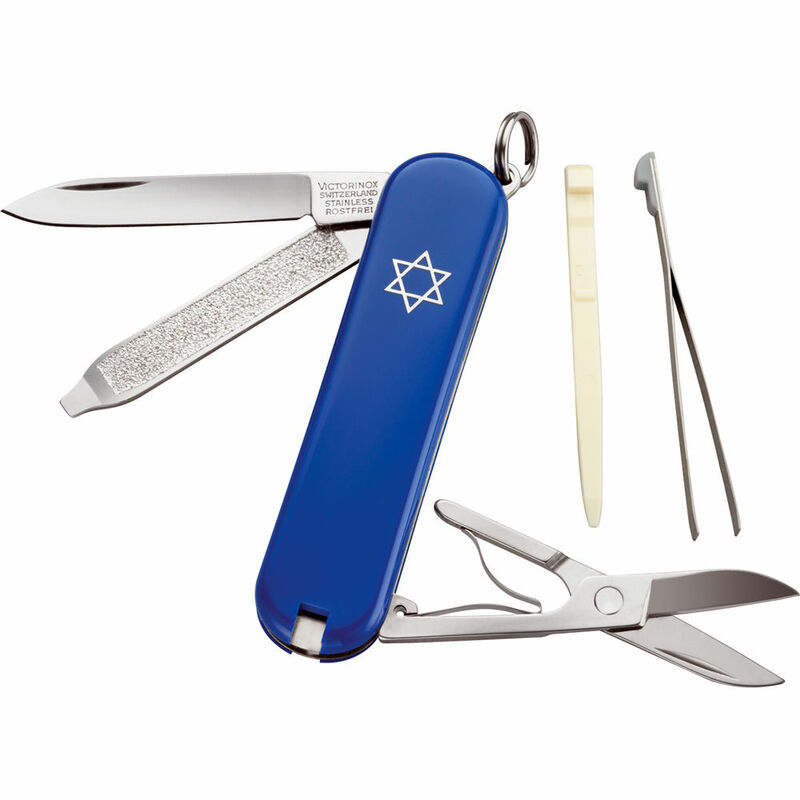 This edition of the Victorinox Classic SD Pocket Knife is designed with a Star of David displayed on brilliant blue Cellidor handle scales. Whether on your key chain or in your pocket, this small and light knife is easy to carry and comes with variety of tools to help you through your busy day, either at work or play. The core stainless steel construction is paired with a blade designed for general cutting tasks and six functions including spring-loaded scissors, a flat-head screwdriver, and tweezers. Box Dimensions (LxWxH) 2.75 x 1.1 x 0.7"
Classic SD Pocket Knife (Star of David Blue) is rated 3.7 out of 5 by 3. Rated 3 out of 5 by HazardousCrow from Not bad. Much MUCH smaller than I anticipated but I find myself using it more often then I would a standard pocket knife. It's small enough that it's attached directly to my key ring and doesn't become a burden when I'm putting my keys in or taking my keys out of my pocke and doesn't become a burden when I'm taking my keys in and out of my pocket. The tweezers could be a little bit stronger as they're not the greatest for removing ticks. Rated 5 out of 5 by Anonymous from Awesome Pocket Knife My grandfather just recently passed away and he always carried a pocket knife. By honoring him I wanted to start carrying one. I got this one (girly I know!) and found it to be very useful! I use it all the time! It's small enough to fit in my pocket and in my purse. Love the color and the nail file!!!!! Love love love! !